Tim Lewis, Paramedic, is Medix Ambulance’s selection for our 2016 Star of Life. 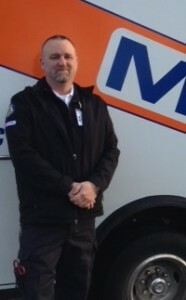 He has been with Medix since November 6, 2006 as an EMT and Paramedic. Tim Lewis was born and raised in Portland, Oregon, where he lived until a 2000 move to Arkansas. While in Arkansas, he began working with adults with disabilities and volunteering with the local fire department. He soon found himself in school for his basic EMT certification, then started work for the local ambulance service. In 2006, Tim and his family relocated back to Oregon, where he began work with Medix Ambulance while completing his Paramedic degree in 2015. Tim is very involved in his church, and began completing two mission trips to Mexico each year about seven years ago. While in Mexico, he conducts vocational training for mechanics, welding, and EMS. He is affiliated with a volunteer ambulance service in San Quintín, in Baja California, Mexico that provides education and training for EMS in the area. He has seen a great outpouring of generosity from hospitals and EMS providers with donations of equipment and training materials.